CHECK OUT OUR 2019 SOCIETY OFFERS, SEE THE 'JOIN US' SECTION BELOW. Alfreton Ladies played fantastic golf on 28th September to win the final of the Derbyshire Golf Inter Club Silver Foursomes competition versus Cavendish played at the neutral venue of Ashbourne. 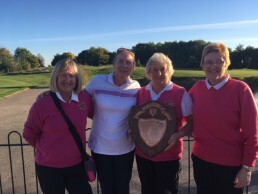 The team comprising Shiela Parkin, Diana Riley, Olivia Dowling and Debbie Matthews certainly did our Club proud! With other Club members following the two matches we were aware that our ladies were playing well but were having to give shots to the opposition. At the half way stage Olivia and Debbie were all square in their match and by the 17th hole Shiela and Diana were also all square. However Shiela and Diana won their last hole to win their match 1 up. Olivia and Debbie played the back nine well to eventually also win 7 up. Overall we were therefore winners 8 up! Having played all 5 matches in the competition away from home the Silver team have had their hands full to keep progressing through to the final. It started in August with the preliminary round away at Broughton Heath, then followed with wins at Burton and then Kedleston to take them through to a semi final versus Maywood at South Chesterfield’s neutral venue. 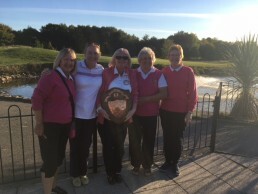 In addition to the players who represented the Club in yesterday’s final, mention should also go to other Members who played in previous rounds, Ann Eley, Wendy Gascoigne, Val Sharpe and Ann Turner. It should also be noted that our Ladies Bronze team did marvellously well in their part of the competition by reaching the semi final before losing to the eventual winners Breadsall. The players in that squad were Linda Baston, Ellie Bennett, Sue Bennett, Sue Heappey and Bev Housley. Alfreton Ladies section has certainly had a great season.